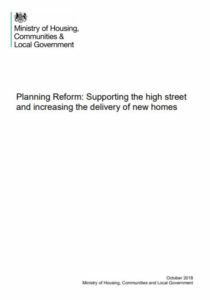 Today is the deadline for responses to the Government’s consultation on its policy paper Planning reform: supporting the high street and increasing the delivery of new homes, which proposes to increase the Permitted Development Rights allowing change of use, and in doing so removes public consultation from decisions affecting the regeneration of town centres. I have responded to this consultation on behalf of The Consultation Institute’s Planning Working Group. While we fully support diversity on the high street, along with provision of much needed housing, we strongly object to the assumption that this can be achieved successfully without public engagement. The consultation suggests that new ‘temporary’ permitted development rights are granted; but also that previously ‘temporary’ rights are made permanent. It would not be unduly presumptuous to assume that (with or without a Government consultation to aid the decision) these new ‘temporary’ rights will themselves become permanent in time. Again, tCI is strongly opposed to this proposed change. The consultation comes at a time when the importance of strengthening consultation has been correctly recognised by the TCPA in its recently published Raynsford Review (read my commentary on the Raynsford Review here). Both the TCPA and the RICS have opposed the extension of permitted development rights. Do you agree that there should be a new permitted development right to allow shops (A1) financial and professional services (A2), hot food takeaways (A5), betting shops, pay day loan shop and launderettes to change to office use (B1)? No. Change of use to this extent would substantially alter the face of the high street and should not go ahead without consultation with those most affected – ie, the local residents. PD Rights exclude consultation and therefore are an inappropriate tool for such a decision. Local people should be consulted on the future of their communities. Furthermore, it is to be benefit of the organisation providing / running the new facility to understand reactions to it from within the local community. Do you agree that there should be a new permitted development right to allow hot food takeaways (A5) to change to residential use (C3)? No. While tCI supports the introduction of more housing and the enlivenment of our high streets, we consider a change of use of this magnitude – one which would conflict with the Local Plan’s allocation as well as the original planning consent – should not be carried out without consultation. It could be argued that a Local Plan or Neighbourhood Plan is of little value if uses can be changed despite an original allocation, and changes to allocations which have previously been arrived at following planning consent could result in local residents becoming less inclined to respond to Local Plan consultations. Do you agree that the permitted development right for the temporary change of use of the premises listed in paragraph 1.9 should allow change to a public library, exhibition hall, museum, clinic or health centre? No. Any change to the built environment impacts on communities, and this is particularly true in the case of libraries, museums, health centres and other amenities. At the heart of our planning system is an understanding that those proposing change should involve local residents – not just as a courtesy but because developers also have much to benefit from involving local people in terms of how the new facility will be used. With local input, proposals can be enriched and finely tuned to a specific neighbourhood, creating a unique scheme well suited to its location. The local community, too, can benefit from consultation: community involvement can promote social cohesion, strengthen individual groups within it and create a shared legacy. This should not be overlooked, particularly in the case of providing public facilities. We are also concerned about the use of the word ‘temporary’ is used in this context. Several of the previously temporary uses are now potentially becoming permanent and it is particularly concerning that permanent change should not occur without consultation. Do you think there is a role for a permitted development right to provide additional self-contained homes by extending certain premises upwards? No. The principle should be consulted upon because it could have a substantial impact on the local community. If regulations concerning upwards extensions are to change, we would expect this to be reflected in local policies. Therefore the local authority should consult (either as part of its Local Plan or separately) on the policy change? If the local policy does not change, tCI believes that consultation should take place on a case-by-case basis. Do you agree that the existing time-limited permitted development right for change of use from storage or distribution to residential is made permanent? No. Local people should be consulted on such substantial changes. Additionally serious concerns have been raised (by the RICS and the TCPA among others) about the quality of such accommodation and the risk it poses to those living there. It is not in the public interest to retain sub-standard accommodation and to give permanent consent to something which was only intended to be temporary. This is detrimental to both the residents and the wider community. Do you agree that the time-limited permitted development right for larger extensions to dwellinghouses is made permanent? No. Local people should be consulted on such changes. Furthermore the proposal to make permanent temporary rights is undemocratic because permission was not originally granted for a permanent change. Changes such as this reduce public confidence in the planning system. Ultimately the public could understandably be mistrustful of any temporary rights being granted in the future if it was felt that such rights could be made permanent in such a way. Do you support a permitted development right for the high quality redevelopment of commercial sites, including demolition and replacement build as residential, which retained the existing developer contributions? No. This would be a very significant change: currently commercial to residential change of use is only allowed under PD rights because the exterior of the building does not change. If an office building was to be demolished and housing developed in its place, we believe that consultation is required. Many communities lack commercial space, which results in higher levels of unemployment, unsustainable outside of the area, and traffic congestion. Although we have a housing crisis, there should not be a general assumption that homes are needed in place of commercial use. Change of use for an entire site – as opposed to a single unit – represents a substantial change to a local community and one which should not take place without consultation. Assuming the Local Plan had previously allocated the land for commercial use, it would also contradict the Local Plan. This both risks lowering the public’s faith in local democracy and will inevitably discourage local people from taking part in local authority-led consultation (or indeed any planning consultations) in the future. What considerations would be important in framing any future right for the demolition of commercial buildings and their redevelopment as residential to ensure that it brings the most sites forward for redevelopment? Consultation with local people. The advantages of developer consultation are numerous. Consultation can deliver a real insight into a local area, create enduring beneficial relationships and enable an early understanding of any issues or misunderstandings which may stand in the way of planning success, thus save time and money. In 2011, the Department for Communities and Local Government’s Localism Bill stated that, ‘Pre-application consultation provides an opportunity to achieve early consensus on controversial issues before proposals are finalised. This should encourage greater community engagement in the process, and result in better quality applications submitted to local authorities, which are more in line with community aspirations, and much less controversial. Such an approach is considered to be inclusive and transparent, with development outcomes more in line with what the community desires.’ We would hope that the MHCLG still subscribes to this point of view but this consultation would suggest otherwise.